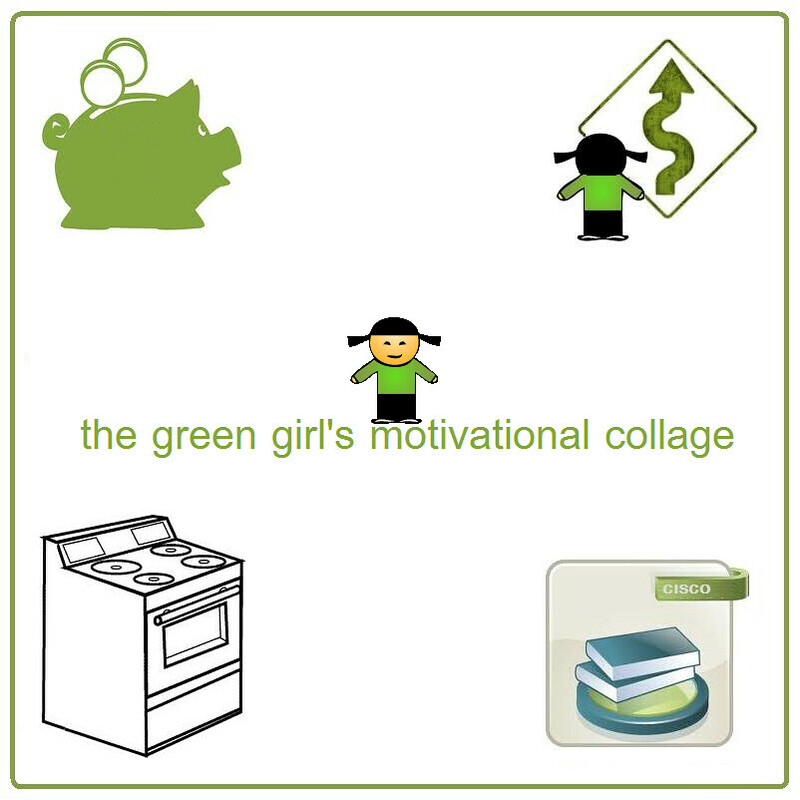 You are quite inspirational Green Girl. I followed your link on saying good-bye and learned much in just a few minutes. That is now one of my assignments. Thanks! I need to do more cooking at home as well. I spend more money than I should on eating out!!! What a cool idea. I recently saw an artist friends "inspiration map." I love the idea of combining both inspiration and motivation in one map. Ooooh I like your collage! I need to join you on the saying good-bye part! Nice tk see that Cisco very us still important. When I was COO at Ikon, we couldn't find enough of them. Maybe if you renew your Cisco Cert it will allow you to earn (and thus save) more money. Just a thought too....make a public proclamation regarding some milestones. i.e. you will be Certified by "X" date or you will have "X" amount by these dates. Just throwing it out there. I went back to look at previous posts about your collage board. I really like that idea. I have every ounce of faith that you will conquer your goal list, you are a Stay- I KNOW this! These visual tools are very helpful! Whatever you focus your energy on will grow. I really like this! I'm sure you'll achieve all your goals. Good luck! love all your goals. Having a visual makes it that much easier to keep it in focus! Definitely think you can accomplish all of those goals! Good luck! Are you one of those people that take charge of the white board and all the black markers when you get into the board room? You can so do the cooking thing. Start with chicken since it is forgiving. Follow some recipes that sounds good to a tee and adjust to your taste. For me, a little pink is a little under done, white and juicy is perfect, white and dry is overdone. I pretty much only cook on a grill, but if you have questions, shoot them my way. My wife cooks on/in the oven/stove and always overcooks everything :-). I tell her that when she thinks it will be done in 10 minutes, pull it off the stove :-). I smile and eat it :-).